Donatello was born in Florence, Italy in 1386, although the year is not certain. He spent most of his life in Florence, Italy. I concluded this because although he traveled to other places, he was born and died in Florence. Donatello trained in the shop of Ghiberti as a goldsmith. Here, the bronze reliefs for the doors of the Florence Baptistery were in the process of being developed. Donatello was a descendent of a branch of the Bardi Family, which was an important family. Donatello's father, Nicolo di Betto Bardi, was a wool-carder. There is not a lot of precise biographical information known about Donatello. We do know that he was raised in a more plebian tradition than Lorenzo Ghiberti. In his life, Donatello traveled to multiple places and worked in Pisa, Rome, and Padua. He worked individually and also with other artists on commissions. 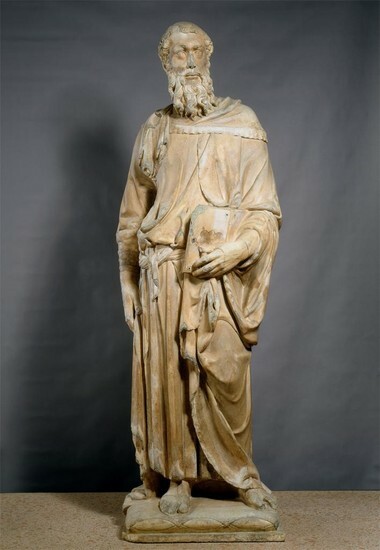 Donatello created sculptures, and some of his works are: St. Mark, David, Mary Magdalen. Donatello worked for Ghiberti- when he was 17, he worked on the bronze reliefs of the First Doors of the Baptistery for him. In the 1430's, Donatello created the pulpit for Prato Cathedral. He did works for the Baptistery. The wife and son of Erasmo da Narni (a general) sponsored one of his works. This work was an equestrian statue of the general. The Medici Family patroned him, and Cosimo de' Medici was a generous patron. Donatello shows individualism in his works because he made sculptures of individual people by themselves. These statues can show human expression and glorify the human. This is an example of individualism because it emphasizes the human's glory and personal achievements rather than the achievements of a group. Donatello also demonstrates humanism in his life and works. He shows this by glorifying men in his sculptures and making them look realistic, powerful, and confident. Donatello "glorified" the human body by making a naked sculpture of David. It is said that Donatello was "gifted with humanistic insight", and he showed the emotions and thoughts of the people he sculpted. Donatello demonstrated both individualism and humanism in his works. The St. Mark is a sculpture of a saint that includes much detail. The man in the sculpture has a beard, hair, and folded robes. He also holds a book and has a confident, relaxed stance. "Concentrated face" with subtleties in St. Mark's eyes and vision- "detailed analysis of the eye"
The St. Mark shows individualism because it is a statue of one man by himself. It glorifies St. Mark, and shows his individual emotions in his posture and expression. Lastly, this sculpture became a symbol of St. Mark, who was known as a noble hero. The folds in St. Mark's clothes are interesting to me and must have been difficult to sculpt! "Donatello." Artble: The Home of Passionate Art Lovers. Artble, 2013. Web. 18 Nov. 2013. "Donatello." Encyclopedia of World Biography. Detroit: Gale, 1998. Biography in Context. Web. 16 Nov. 2013. "Donatello." International Dictionary of Art and Artists. Gale, 1990. Biography in Context. Web. 16 Nov. 2013. "Donatello." World Eras. Ed. Norman J. Wilson. Vol. 1: European Renaissance and Reformation, 1350-1600. Detroit: Gale Group, 2001. Biography in Context. Web. 16 Nov. 2013.
" Saint Mark." ARTstor. ARTstor, Inc., 2013. Web. 18 Nov. 2013. Saint Mark. N.d. Photograph. Museo Di Orsanmichele, Florence, Italy.